In just 36 months' time, on Friday 27 July, the 30th Olympiad will be officially declared open in London. With the Paralympics following on more or less straight away (and closing on Sunday 9 September 2012), for six weeks it will be virtually impossible to get a hotel room in London, nor a flight in or out. And for a period before and after the games. No marketing skills will be needed to gain 100% occupancy. London is very fortunate to have won the games with the worst economic conditions since WWII now upon us. We have something to look forward to. A great tract of derelict land in East London is being brought to life and we will be left with a working legacy founded on the efforts of a small team that persuaded the world that London was the place for the Olympics of 2012. Think of Stratford (and much else) without the challenge of the Olympics. It is a grim outlook. To make the most of the games the travel industry, in all its diverse activities, needs to get involved at this time, and not just for a few busy weeks three years away. We need people to want to come to London now. The usual tourists the city will always attract but what is needed over the next three years is the Olympic bonus. The extra visitors that would not usually come. We want them to see as much as possible of what is going on. And to take the message back home persuading others to follow. The more the merrier. The start has been slow with British Airways becoming an Official Partner 12 months ago and in more recent times Holiday Inn, part of Intercontinental Group (IHG) joining as an Official Supplier. Such is the machinations (or you might say commercial expertise) of the Olympic Organising Committee (based in Lausanne) BA ranks below Coca Cola as a UK supplier only, with Holiday Inn even lower down the ladder. But you don’t have to be involved with the official organisations to make the most of the Olympics. After all we are all paying for it. There are enormous possibilities for the travel trade to greatly benefit from this once in a lifetime opportunity, and to do this during the next three years. And afterwards too. AERBT visited the Olympic Park last week, hosted by ODA (Olympic Delivery Authority) Australian Chief Executive David Higgins and Paul Deighton who holds a similar position with LOCOG (London 2012 Organising Committee). In simple terms ODA is building the games and LOCOG running them. You have to be impressed. We are told that everything is on time with the centrepiece, the athletics stadium, virtually structurally complete with the seats ready to go in. In 12 months’ time it will be finished as will be the aquatics centre, velodrome and other sports venues. Organised tours for the general public are not available due to the complexity of Europe’s largest building site. ODA has gone out of its way to organise school bus visits and this is a rolling programme, with a similar operation for local residents. If you want to see the Park, and it is worth seeing, take the Tube to Stratford Regional and then the DLR to Pudding Mill Lane. Walk down the Greenway. You also get a good look at the site by parking on the A12 southbound in the Waltham Forest area. The most spectacular view however is taking off from London City Airport where, if you are lucky with both wind and flight routing, you can go right over the stadium. Likewise if you are sitting at a starboard window inbound to Heathrow. BA captains please tell your passengers. The 80,000 capacity centre piece could be reduced to a 25,000 stadium after the event, but nothing has been decided at this moment in time. It is a very flexible edifice. Organisers estimate that some 7.7 million tickets would be available for the Olympic Games, and 1.5 million tickets for the Paralympic Games. They will be going on sale in January/February 2011, with at least 50% of these priced under £20. To reduce traffic, ticketholders would be entitled to free use of London's public transportation network on the day of the event. With modern technology, such as used at Wimbledon, it is hoped that the empty seats seen at Beijing will not happen, standby patrons able to quickly take up space not being used. However 20,000 press will be accredited as well as a similar number from the so-called Olympic ‘family’. Events such as the marathon, triathlon and road cycling will have no restrictions on spectators and the organisers are working on a scheme for non-seated (fee paying) visitors to enter the Olympic Park and watch events on huge screens. This could add substantially to numbers and should prove a wonderful day out. It is a proper park, a recreational area with the River Lee running from north to south, various canals, and plenty of green space. Two thousand trees are growing in a nursery, ready to be transplanted. 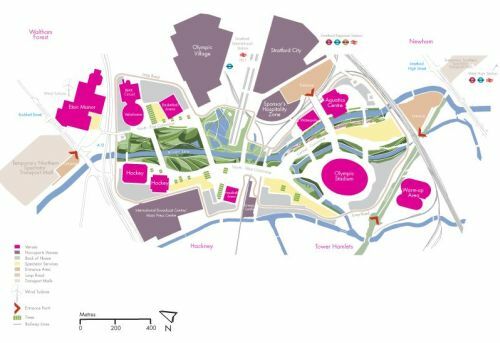 Sitting next to the Olympic Park is Stratford City, which shares Stratford International Station, a UKP1.45bn development by Westfield also responsible for the White City site of the same name, again adjoining a former London Olympic venue. Westfield Stratford City is due to open in 2011 and includes 300 shops, with John Lewis, Marks and Spencer and Waitrose already signed up, and 5,000 car parking spaces, presumably with the same excellent electronic vehicle management system indicating vacant spaces used in the west London venture. Sited not far from the Olympic Village it should prove very popular with the rich 2012 professional competitors. If you want to get a real feeling for the games a London 2012 Open Weekend takes place Friday, Saturday Sunday 24/25/26 July – a series of events across the whole country enabling access to excellence in the arts, culture and sport celebrating three years to go. AERBT supports London 2012. Britain’s wonderful Beijing results may not have come about had Paris been the venue for the next Olympics.